This prestigious award recognises the impact of applied research into teaching. 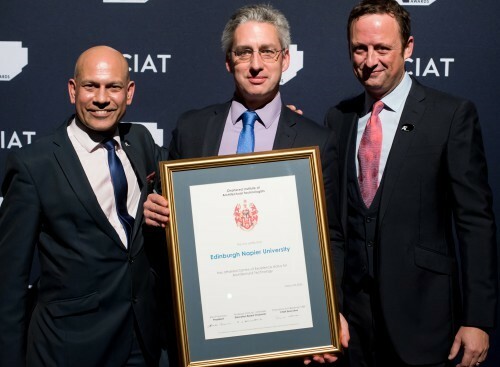 Edinburgh Napier was awarded Centre of Excellence status by the Chartered Institute of Architectural Technologists at a packed awards event held in the Village Underground in London. The event celebrated the use of technology in architectural design, and the university is one of only four in the UK to hold this title. The award was collected on behalf of the School of Engineering & Built Environment (SEBE) by Professor Sean Smith, Director of the Institute for Sustainable Construction and Professor of Construction Innovation. Sean, who teaches on the Architectural Technology (AT) undergraduate programme, said: “This is a fantastic achievement by all the staff and students within Edinburgh Napier University. “The award acknowledges the expertise and wide range of staff who deliver across our programmes from the school, institute, research centres and RMP acoustics. The Centre of Excellence status is awarded for the impact of the applied research and also the translation of research into teaching both for the university’s undergraduate and postgraduate AT programmes. Staff involved in delivering the Centre of Excellence programmes include John Wood, Robert Mason, Mike Lee, Dr Suha Jaradat, Dr Jon Stinson, Russell Macdonald, Dr Celine Garnier, Eleni Kontesidou, Nick Taylor, Julio Bros-Williamson, Prof Sean Smith and Dr Andrew Brown.